The Los Angeles Sentinel Newspaper is proud to announce the 3rd annual Taste of Soul on Crenshaw. This wonderful fun-filled family event will take place Saturday, October 18, 2008 located on Crenshaw Boulevard between King and Rodeo Boulevard. The Los Angeles Sentinel has partnered with 94.7 The WAVE and 102.3 KJLH Radio Free as the official radio partners for Taste of Soul 2008.For the people that missed the last two historic years, you have missed a day of fun- filled festivities, great music, beautiful people, and some of the best food southern California has to offer.Last year Mayor Antonio Villaraigosa was quoted as saying, “Over 100,000 people came out to support Taste of Soul”. Councilman Bernard Parks was quoted as saying “This was the largest gathering of African Americans in the history of Los Angeles”.The buzz has spread and the official word around town is the L.A. Sentinel’s Taste of Soul is with out a doubt the best festival Los Angeles has to offer. 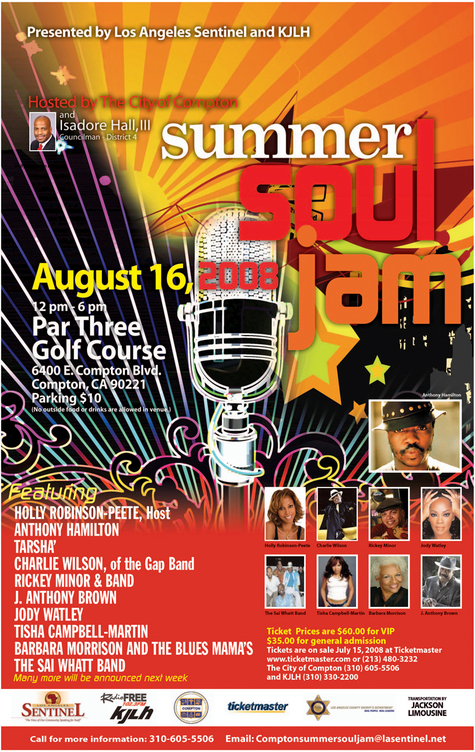 It is estimated that this years Taste of Soul is going to bring out a record number in attendance. With enough food to feed an entire city, Taste of Soul is like nothing you have seen or experienced before. There will be people of all ages and ethnicities including many local and national businesses providing the community with important consumer information. With over 200 vendors consisting of everything you need from clothes, to jewelry, to art and of course tasteful food, Taste of Soul 2008 won’t miss a beat as far as serving the community. There will be 3 musical stages, celebrity guest, a beer & wine Garden, many different family activities, and did I forget to mention lots of SOUL FOOD!! Taste of Soul promises to be one of the best days 2008 has to offer. For more information please call Brenda Marsh-Mitchell at 323-299-3800.